We don't associate tornadoes with Christmas which is what makes this situation so potentially dangerous -- people getting caught unaware. That is why I'm writing about it now. On this particular chart, 15% is a significant threshold. Austin, Houston, Waco and College Station all have a threat of a tornado or damaging winds. These may occur after dark. This is very, very dangerous if it evolves as predicted. 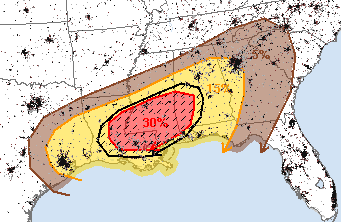 The atmospheric parameters come together for major tornadoes, especially in the hatched area. 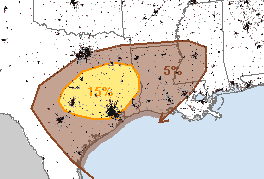 I know the last thing you want to do on Christmas is have a weather radio on but from Lake Charles, Baton Rouge, New Orleans, Jackson and Birmingham I urge you to do just that. If you have relatives or friends in these areas, please make sure they are aware of this threat when you call or write them with Christmas greetings.